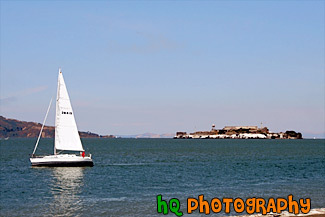 A scenic picture taken of Alcatraz Island and a white sailboat floating in front with blue sky seen above. A shot of the Bay Bridge with fog covering the hills of San Francisco, California. In 1929, the state of California began studies to find an alternative to the ferries, which were clogging the waterways. After years of study, and a little over three years of construction, the Bay Bridge opened to traffic on November 12, 1936. Its total cost, including an electric railroad which has since been abandoned, was $79.5 million. The best ways to enjoy the Bay Bridge are: From the San Francisco waterfont along Embarcadero Street, where you can see and photograph the span, and walk under it. 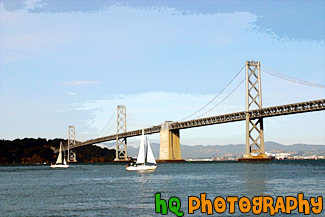 A scenic picture taken of the Bay Bridge in San Francisco, California with sail boats sailing underneath. This bridge connects the cities of San Francisco and Oakland. The Bay Bridge opened to traffic on November 12, 1936. Its total cost, including an electric railroad which has since been abandoned, was $79.5 million. The best ways to enjoy the Bay Bridge are: From the San Francisco waterfont along Embarcadero Street, where you can see and photograph the span, and walk under it. 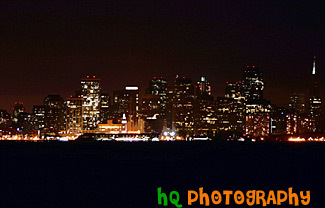 A scenic picture taken of the city of San Francisco, California from across the bay at Treasure Island. This picture was taken at night and you can see all the tall buildings of the city lit up in the darkness. 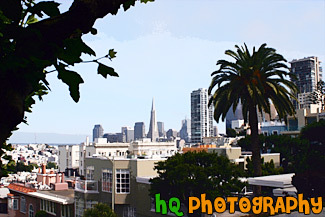 A scenic picture taken right smack dab in the center of downtown San Francisco, California. This picture was taken near the famous Lombard Street looking towards Treasure Island, the Bay Bridge, the Ferry Building, and Coit Tower on a partly foggy day. 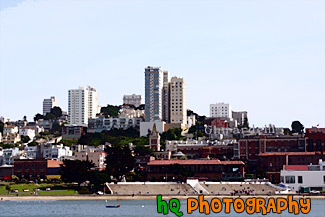 In this picture you can see the scenic shapes and colors of the buildings and apartments of San Francisco. San Francisco is a city full of things to do. San Francisco offers a wide arrange of activities from climbing to the top of Coit Tower, admiring the grandeur of the Golden Gate Bridge, or even exploring the infamous Alcatraz prison! And don't forget about the Golden Gate Park, the Japanese Tea Garden the Botanical Garden plus so much more! 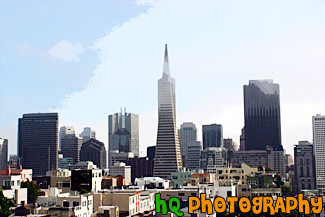 A scenic picture taken of the tall buildings the downtown San Franicsco, California financial district including the Transamerica pyramid. San Francisco's financial district is ranked as one of the top four financial centers in the nation and some of the most highest paying jobs reside here. A picture taken of Ghirardelli Square in San Francisco, California. This picture was taken out on a dock looking in towards the shore and the square. Ghirardelli Square is a historic San Francisco destination, offering shopping San Francisco style, waterfront dining near Fisherman's Wharf, art galleries, family events, walking tours and more. Today the original 1860 cast iron chocolate grinder from France is located on the lower plaza, and other chocolate-making equipment is still operating on a small scale in the Ghirardelli Chocolate Manufacture. A scenic picture taken of the famous Lombard Street which is located in downtown San Francisco, California. 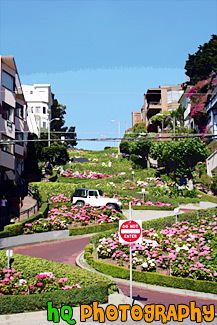 Lombard Street has eight sharp turns (or switchbacks) that have earned the street the distinction of being the most crooked (winding) street in the United States. One of San Francisco's car lines stops at the top of this block. The crooked section of the street is reserved for one way traffic traveling east (downhill), and is paved with bricks. The section was built in 1923 to accommodate the steepness of the slope of the hill. The road is surrounded with beautiful shrubs and flowers and stunning bay views that draw in tourists day after day. 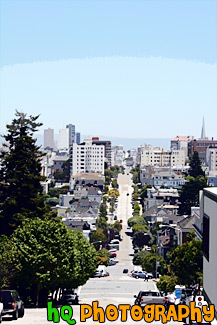 From the top of the hill you will see amazing views of the bay such as Telegraph Hill and North Beach. This is a scenic picture taken of Lombard Street which is located in downtown San Francisco, California. Lombard Street is a major east to west street that crosses the entire city of San Francisco. It is best known for one block on Russian Hill between Hyde and Leavenworth Streets, with eight sharp turns (or switchbacks) that have earned the street the distinction of being the most crooked (winding) street in the United States. One of San Francisco's car lines stops at the top of this block. The crooked section of the street is reserved for one way traffic traveling east (downhill), and is paved with bricks. The section was built in 1923 to accommodate the steepness of the slope of the hill. The road is surrounded with beautiful shrubs and flowers and stunning bay views that draw in tourists day after day. 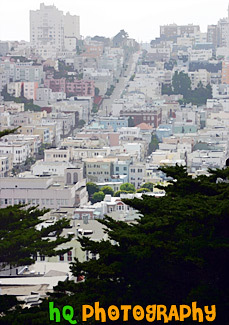 From the top of the hill you will see amazing views of the bay such as Telegraph Hill and North Beach. A scenic picture taken of downtown San Francisco, California from Telegraph Hill. 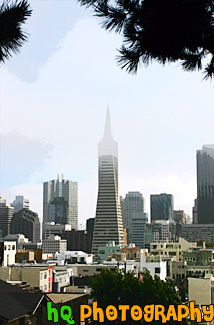 In this picture you can see the Transamerica Pyramid with fog covering the tip of it. The Transamerica building was completed in 1972 and was the tallest building in the United States west of the Mississippi River from 1972-1974; surpassed by the Aon Center in Los Angeles. The Pyramid is no longer the company headquarters, but it serves as Transamerica's corporate logo and is strongly identified with the corporation. Today it is a world-class office tower and home to more than 50 high-profile firms employing about 1,500 people. A scenic picture taken of the city of San Franicsco, California. In this picture you can almost see all that San Francisco has to offer all at once. 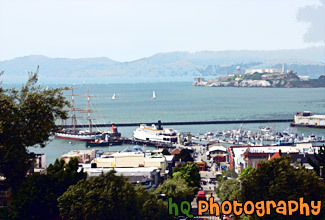 In the back right you can see the famous Alcatraz Island, the middle left floats the Balclutha, in the middle bottom is a famous San Francisco cable car cpming up Hyde Street, and you can see many sailboats floating in the bay. A scenic picture taken of the crookedest street in the U.S. which is also more commonly known as Lombard Street. Lombard Street is located in downtown San Francisco, California. Lombard Street is a major east to west street that crosses the entire city of San Francisco. It is best known for one block on Russian Hill between Hyde and Leavenworth Streets, with eight sharp turns (or switchbacks) that have earned the street the distinction of being the most crooked (winding) street in the United States. 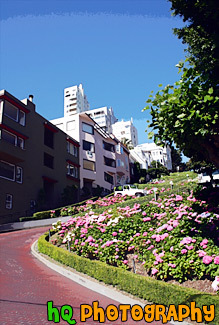 Lombard Street is a major tourist's attraction of San Francisco. A pretty picture taken of downtown San Francisco, California from Telegraph Hill. In this picture you can see the tall buildings of San Francisco such as the Transamerica Pyramid, a pretty palm tree in the foreground, and the Bay Bridge in the distance. 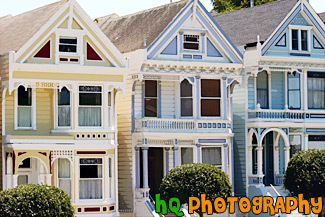 A scenic picture taken of three of the Victorian houses in Postcard Row/Alamo Square in San Francisco, California. These houses on Postcard Row are also known as the "Seven Sisters of Postcard Row" or the "Painted Ladies". This row has become (along with the Golden Gate Bridge and Alcatraz) synonymous with San Francisco. Most visitors associate these homes with the TV show Full House, Tales of the City, Too Close for Comfort and a wide array of other films and advertisements. From a top the Alamo Square Park overlooking these houses you can view the entire city of San Francisco and skyline. This entire area is filled with Victorian style buildings with pleasant sunny lawns, mostly on mild slopes, with a few large cypress trees and tennis courts. Right here you're able to relax and study the abudance of fine architecture which surrounds the park. 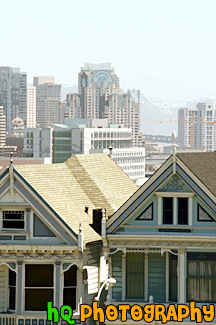 An amazing view of the victorian houses near Alamo Square Park in San Francisco with the city in the background. In this picture you can see the buildings of San Francisco such as the Transamerica building and the tip of the City Hall building behind the victorian homes. 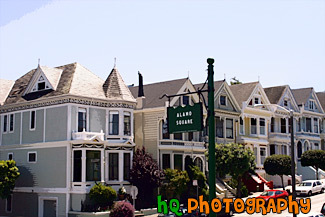 The famous Alamo Square Park is known for where the sitcom "Full House" was filmed. These houses on Postcard Row are also known as the "Seven Sisters of Postcard Row" or the "Painted Ladies." 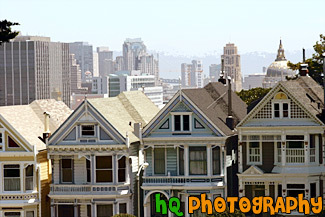 An amazing view of the victorian houses near Alamo Square Park in San Francisco with the city in the background. In this picture a couple of locals are enjoying a break hanging out on the grass in the park while enjoying the spectacular view of San Francisco. The famous Alamo Square Park is known for where the sitcom "Full House" was filmed. These houses on Postcard Row are also known as the "Seven Sisters of Postcard Row" or the "Painted Ladies". A scenic picture taken of the victorian houses at the famous Alamo Square known for where the sitcom "Full House" was filmed. These houses on Postcard Row are also known as the "Seven Sisters of Postcard Row" or the "Painted Ladies" and are a popular tourist attraction in San Francisco. An amazing view of two victorian homes close up near Alamo Square Park in San Francisco with the city in the background. 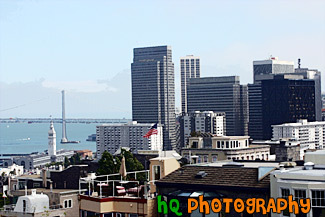 In this picture you can see the Bay Bridge in the background along with the tall buildings of downtown San Francisco. 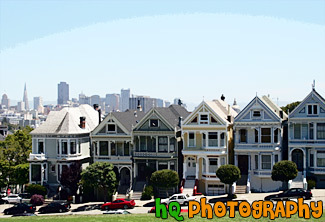 The famous Alamo Square Park is known for where the sitcom "Full House" was filmed. These houses on Postcard Row are also known as the "Seven Sisters of Postcard Row" or the "Painted Ladies". A scenic picture taken of the big Balclutha boat sitting in front of Alcatraz Island on this beautiful day in San Francisco. Alcatraz is a popular tourist attraction in this area as it was once used as a prison facility to hold inmates. 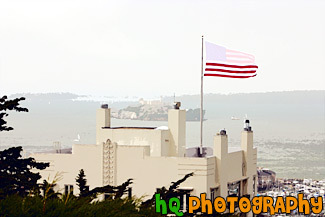 A scenic picture taken of Alactraz Island and a flag in the foreground in San Francisco. 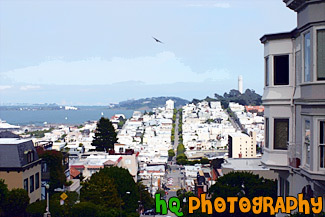 This picture was taken from the Coit Tower. 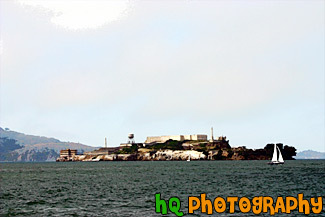 A scenic picture taken of the Alcatraz Island and prison located in the bay waters in San Francisco, California. You can see Alcatraz in this photo through two trees. 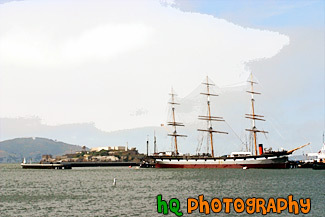 A scenic picture taken of Alcatraz Island located in San Francisco, California. Alcatraz Island served as a military fortification in the 1850’s, an incarceration facility for Spanish-American War prisoners, and a federal maximum-security prison from 1934 to 1963. Alcatraz Island is now one of Golden Gate National Recreation Area's most popular destinations, offering a close-up look at a historic and infamous federal prison long off-limits to the public. 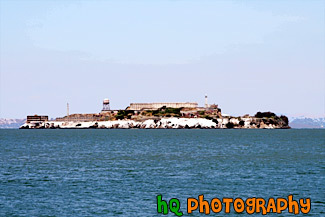 Alcatraz Island is also commonly known as the "Rock." 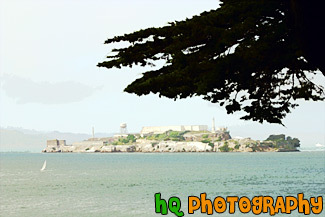 A scenic picture taken of Alcatraz Prison and island on a sunny day in San Franciso, California. Alcatraz Island served as a military fortification in the 1850's, an incarceration facility for Spanish-American War prisoners, and a federal maximum-security prison from 1934 to 1963. Alcatraz Island is now one of Golden Gate National Recreation Area's most popular destinations. 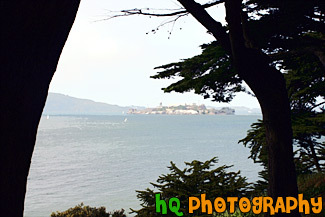 A scenic picture taken of Alcatraz Island with a tree branch in view from atop a hill in San Francisco, California. 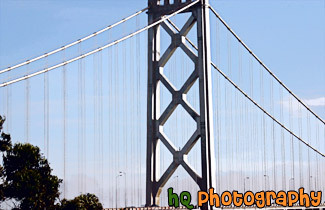 A close up picture taken on the arch of the Bay Bridge which is located in San Francisco, California and connects with Oakland. There are no pedestrian walkways or vista points on the Bay Bridge, but you can drive on it and stop midway at Treasure Island to view the span. The Bay Bridge is a very popular commuting bridge as over a quarter million vehicles cross the San Francisco Bay Bridge daily. A scenic picture taken of the Bay Bridge and the Ferry Building from Coit Tower on top of Telegraph Hill. San Francisco is a city full of things to do. San Francisco offers a wide arrange of activities from climbing to the top of Coit Tower, admiring the grandeur of the Golden Gate Bridge, or even exploring the infamous Alcatraz prison! And don't forget about the Golden Gate Park, the Japanese Tea Garden the Botanical Garden plus so much more! 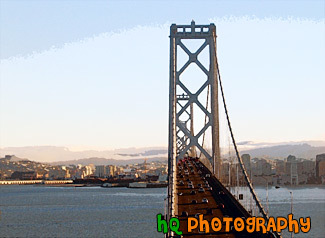 A scenic picture taken of the Bay Bridge which is located in San Francisco, California and connects with the city of Oakland. 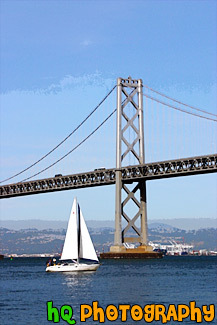 In this picture there is a single sailboat floating in front of the bridge on a blue sky sunny day. 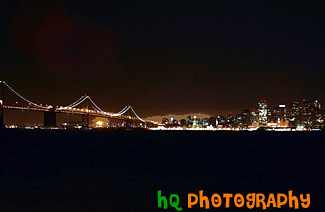 A scenic picture taken of the Bay Bridge and San Francisco California at night from across the bay at Treasure Island. 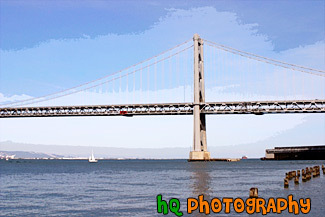 A scenic picture taken of one of the archs of the Bay Bridge which is located in San Francisco, California. This photo was taken on a sunny day with blue sky all around. A sail boat can be seen under the bridge. 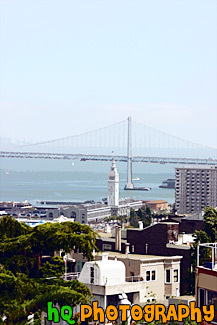 A scenic picture taken of the Bay Bridge from atop Telegraph Hill where Coit Tower is located. 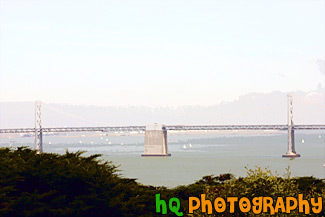 In this picture you can see the many sailboats sailing near and around the Bay Bridge on sunny day in May. A scenic picture taken of the Bay Bridge in San Francisco, California while looking through the red bars of the Golden Gate Bridge. In this picture you can also see Coit Tower and the Transamerica Pryamid located in downtown San Francisco on this sunny day. 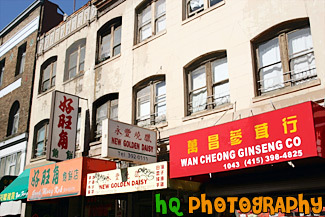 A scenic picture taken close up of a building and signs located in downtown Chinatown in San Francisco, California. 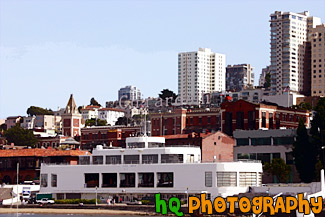 A scenic picture taken of a view of the interesting building architecture of the city of San Francisco. This picture was taken from Telegraph Hill looking in the north-west direction. A scenic vertical picture taken close up of a San Francisco cable car. From the street sign in the back ground you can see that this cable car is just passing the famous Lombard Street. This cable car is making its way up Powell to Hyde St. San Francisco's cable cars are unique in that they are the only street railway in which the cars do not operate under their own power. Instead, the cars are propelled mechanically, by "gripping" a continuously moving steel cable which runs in a conduit underneath a slot between the rails. 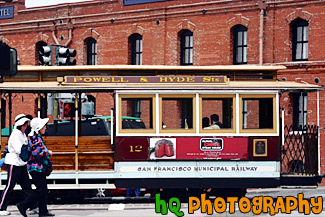 A close up picture taken of a San Francisco Cable Car which makes its way up Powell and Hyde St. San Francisco's cable cars are unique in that they are the only street railway in which the cars do not operate under their own power. Instead, the cars are propelled mechanically, by "gripping" a continuously moving steel cable which runs in a conduit underneath a slot between the rails. The cable is kept in motion by an engine in a centrally-located powerhouse. The cable car system was developed in San Francisco because of a guy named Andrew Hallidie whom in 1869 witnessed a horse-car accident and wanted to develop a cable railway to stop such accidents. 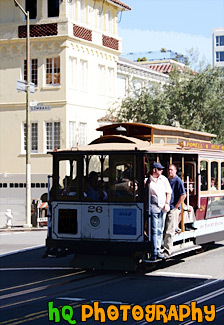 In 1873 HGallidie tested the first cable car system near the top of Nob HIll at Clay and Jones Streets. Ever since this date the Cable Car system kept growing and became one of the symbols of San Francisco. Cable Car, Powell & Hyde Sts. 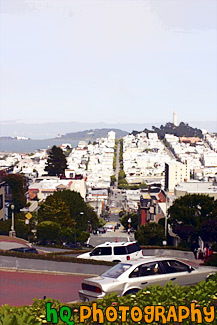 A scenic picture taken of cars driving down the famous Lombard Street located in San Francisco, California. Lombard street is known as the most crooked street in the world. 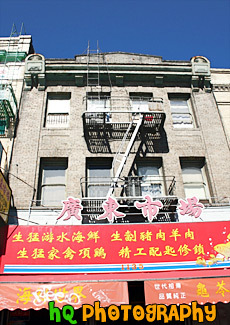 A scenic picture taken of a side of a couple buildings in downtown Chinatown San Francisco, California. You can see the chinese writing on the sides of the buildings. 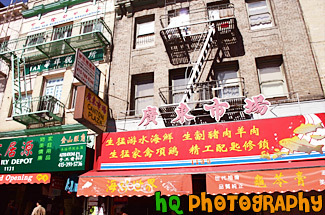 A scenic picture of a building taken in China Town which is located in San Francisco, California. 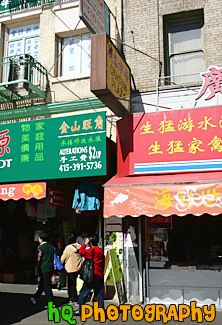 San Francisco's Chinatown begins at the dragon-crested gate at Grant Avenue and Bush Street, and the entrence is called "Dragon's Gate." This city within a city is best explored on foot; exotic shops, renowned restaurants, food markets, temples and small museums comprise its boundaries. A scenic picture of a sidewalk and some chinese people taken in downtown Chinatown, San Francisco, California. 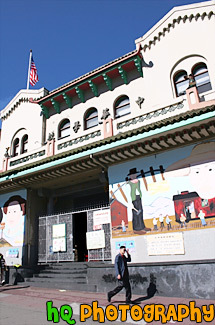 San Francisco's Chinatown begins at the dragon-crested gate at Grant Avenue and Bush Street, and the entrence is called "Dragon's Gate." This city within a city is best explored on foot; exotic shops, renowned restaurants, food markets, temples and small museums comprise its boundaries. A scenic picture taken of downtown Chinatown with a Chinese man walking down the street located in San Francisco, California. San Francisco's Chinatown begins at the dragon-crested gate at Grant Avenue and Bush Street, and the entrence is called "Dragon's Gate." This city within a city is best explored on foot; exotic shops, renowned restaurants, food markets, temples and small museums comprise its boundaries. 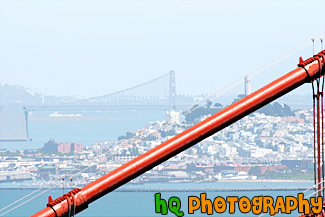 An interesting picture taken close up of the red beam of the Golden Gate bridge. Behind the beam you can see the city of San Francisco, California along with a view of the Bay Bridge and Coit Tower. 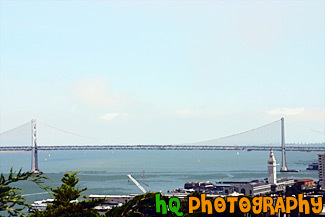 A close up picture of Coit Tower located on Telegraph Hill in San Francisco, California. Coit Tower on Telegraph hill in San Francisco has provided visitors, and locals, with impressive views of The City since its completion in 1933. 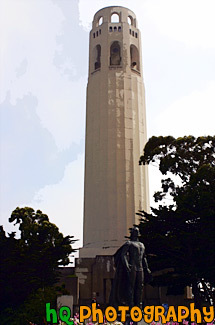 Coit Tower was built due to admiration for the fire fighters who fought the 1906 earthquake fires. Many believe the tower was designed in the shape of a fire hose nozzle in relation to that admiration. 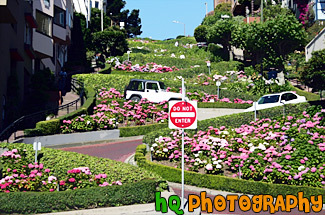 A scenic picture taken of the crooked Lombard Street which is located in downtown San Francisco, California. Lombard Street is a major east to west street that crosses the entire city of San Francisco. It is best known for one block on Russian Hill between Hyde and Leavenworth Streets, with eight sharp turns (or switchbacks) that have earned the street the distinction of being the most crooked (winding) street in the United States. 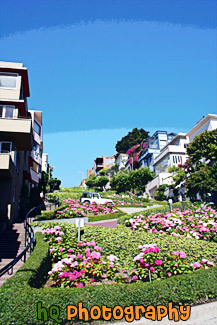 Lombard Street is a major tourist's attraction of San Francisco. A scenic picture taken of downtown San Francisco on a cloudy day. 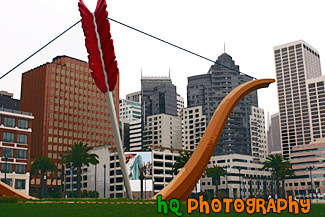 From this picture you can see the tall buildings of San Francisco and the symbolic anchor that is displayed by the waterfront. A scenic picture taken of the tall buildings of downtown San Francisco, California and the Bay Bridge from Coit Tower on Telegraph Hill. In this picture you can also see the Ferry Building in front of the Bay Bridge. San Francisco is a city full of things to do. San Francisco offers a wide arrange of activities from climbing to the top of Coit Tower, admiring the grandeur of the Golden Gate Bridge, or even exploring the infamous Alcatraz prison! And don't forget about the Golden Gate Park, the Japanese Tea Garden the Botanical Garden plus so much more! A scenic picture taken of three and a half victorian houses at the famous Alamo Square known for where the sitcom "Full House" was filmed. In the distance you can see the San Francisco Bay Bridge, the city's city hall building and other tall buildings from downtown San Francisco, California. These houses on Postcard Row are also known as the "Seven Sisters of Postcard Row" or the "Painted Ladies" and are a popular tourist attraction in San Francisco. A scenic picture taken in San Francisco, California of the Ferry Building and the Bay Bridge in the background. The famous Bay Bridge is the bridge that connects San Francisco with Oakland. San Francisco's historic ferry building is home of the Farmer's Market and some permanent market shops, cafes, and restaurants. Its 240-foot clock tower, modeled after the 12th century bell tower in Seville, has been the San Francisco waterfront icon for more than 100 years. Developers spent nearly $90 million to renovate the building, which withstood both major earthquakes, and turn it into what they hope will become a thriving food center. A scenic picture taken of the Financial District in downtown San Francisco with the Transamerica Pyramid seen in the center. This photo was taken from a dock in the San Francisco bay. 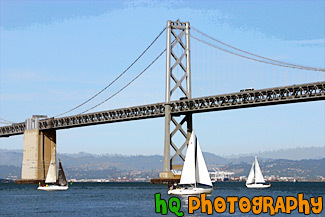 A full view picture taken of the Bay Bridge and some sailboats sailing by on a sunny day in San Francisco, California. The bay bridge connects the city of San Francisco with the city of Oakland. A scenic picture taken of the Ghirardelli Square on a sunny day which is located in San Francisco, California. Ghirardelli Square is a historic San Francisco destination, offering shopping San Francisco style, waterfront dining near Fisherman's Wharf, art galleries, family events, walking tours and more. Today the original 1860 cast iron chocolate grinder from France is located on the lower plaza, and other chocolate-making equipment is still operating on a small scale in the Ghirardelli Chocolate Manufactory. 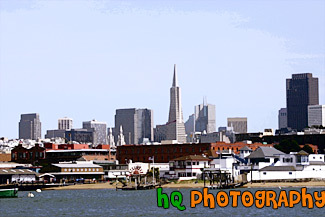 A scenic picture taken of Ghirardelli Square with the city of San Francisco seen surrounding it. You can see the Transamerica pyramid and San Francisco's financial district as well as the bay waters and sailboats in the foreground. This photo was taken on a sunny fog-free day in the bay area. 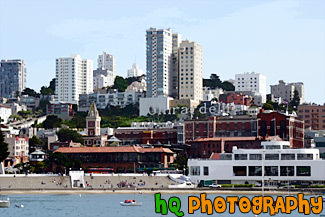 A scenic picture taken of Ghirardelli Square looking at it from the bay waters of San Francisco, California. Ghirardelli Square is a historic San Francisco destination, offering shopping San Francisco style, waterfront dining near Fisherman's Wharf, art galleries, family events, walking tours and more. 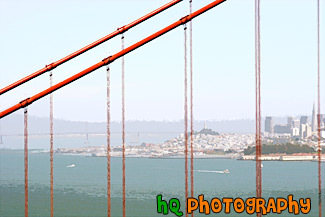 This picture was taken on a fog-gree sunny day in the bay area. 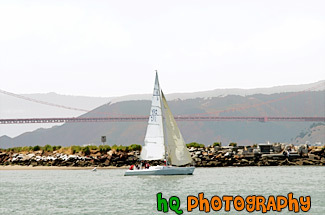 A scenic picture taken of a white sailboat floating off shore in front of the Golden Gate Bridge seen in the bay in San Francisco, California. Fog is seen over the hill just beyond the bridge. 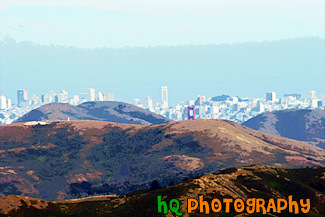 A scenic picture taken close up of golden hills and the tip of the golden gate bridge in San Francisco. This photo was taken from Mt. Tamalpais in Marin County, California. The city of San Francisco is seen in the background. 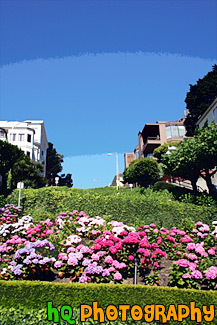 A close up picture taken of the flowers and curves of Lombard Street in downtown San Francisco, California. Lombard Street has eight sharp turns (or switchbacks) that have earned the street the distinction of being the most crooked (winding) street in the United States. One of San Francisco's car lines stops at the top of this block. A scenic picture taken of a long downhill road in San Francisco, California. This picture was taken on a beautiful sunny blue sky day. 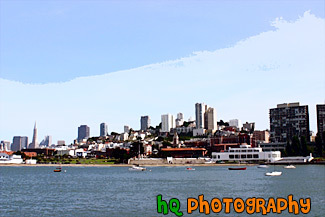 A scenic picture looking at Treasure Island and Oakland in the background from San Francisco, California. In the picture you can see the Oakland-Bay Bridge on the other side of Treasure Island. 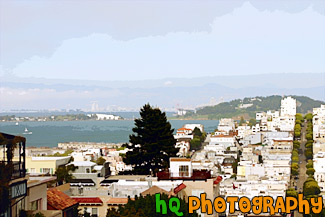 You can also see the interesting buildings, apartments, and homes of San Francisco in the foreground. Oakland & Treasure Island from S.F. 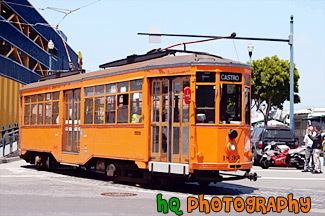 A scenic picture taken of an orange cable car in downtown San Francisco right by the warf. 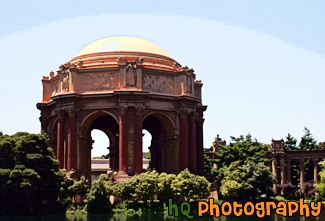 A day time picture taken of the Palace of Fine Arts Exploratorium located in San Francisco, California. 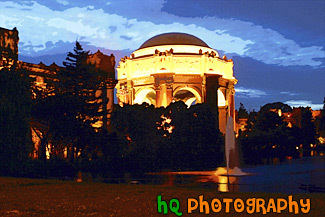 The task of creating a Palace of Fine Arts for the 1915 Panama-Pacific International Exposition fell to the architect Bernard R. Maybeck, then fifty years old and known for his innovative ideas. Setting to work on this new project, he chose as his theme a Roman ruin, mutilated and overgrown, in the mood of a Piranesi engraving. The Palace of Fine Arts was meant to give delight by its exterior beauty, but its purpose was also to offer all visitors a stimulating experience within doors.